In the summer of 2009, the Gordon-Wascott Historical Society published an impressive 494 page history of the Gordon area and of many of the families in the area. The following text is reproduced from the section titled, "Pagac's Pine Resort, 1948-98." Paul and his wife, Rose, were the owners of several rental properties in Milwaukee, including taverns and other businesses. So, in the Spring of 1949, Paul, Rose, and their two daughters. Penny and Judy, moved from Milwaukee to clear land, build a home and start a new life in the resort business. 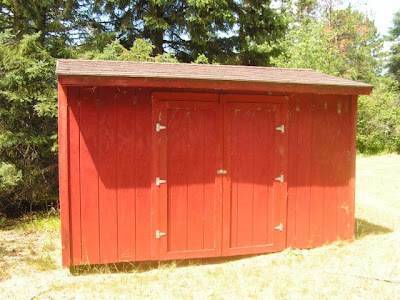 Paul hired a local carpenter and built two cabins to begin with. Because the cabins were so filled with reservations throughout the summer, the family had to stay in two tents. Everyone was busy pulling out hazel brush, creating a beach, and peeling jackpine logs for more cabins. It was a busy time for the family. After the season was over in September, they moved into the first cabin. Judy and Penny attended school in Gordon through November, and then the family returned to Milwaukee for the winter. The following summer, Paul and Rose's son, Paul Frank, Jr., was born. The family had permanently moved up to Gordon and the third cabin was built. Paul built the fourth cabin himself, and eventually built the last two cabins. The cabin as. The cabins were constructed of logs that were all hand-peeled. Paul also built all of the bed frames out of logs for the cabins, in addition to doing all of the cabinets and interior work. A fish cleaning hut was built as well from the logs. Paul loved fishing, hunting and trapping. 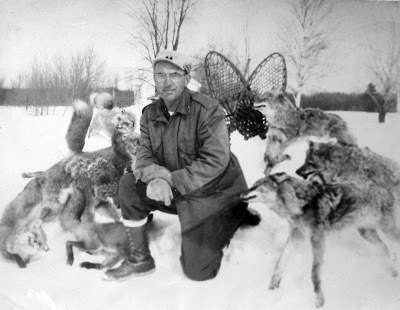 He was quite the trapper, getting muskrat, mink, beaver, otter, weasel, fox, and even an occasional wolf, bobcat or skunk! Even his daughter, Judy, had her own weasel trap line. Paul also harvested wild rice for many years, which became another family project. Most of the resort's customers were from Milwaukee and Chicago and were good friends of the Pagac's. Over the years, the Resort even saw third-generation guests. Paul and Rose were known for their friendship and hospitality. Often, Friday nights included a fish fry and card game later. Paul's favorite card game was Sheepshead, but most of the time poker was played. Rose, who was an amazing cook, frequently shared her homemade potato bread and delicious Sunday dinners with guests. Mondays at the Resort were wash days. Rose insisted on using her wringer washing machine throughout the Resort's 50 year history. The bedding always had to be hung outside to dry and then ironed with a mangle to perfection - wrinkles were not acceptable! Paul passed away in 1986 and Rose continued to operate the Resort until 1998, when it was sold. The cabins were then sold off individually, ending the Resort as it was. Rose passed away in 2002. She had been an active member in the community, enjoyed bowling, and was a member of the 50/50 Club. Penny (Clair Hickman) and Judy (Fred Keith) remain in the area, and Paul Frank, Jr. (Joyce) resides in Forks, Washington. 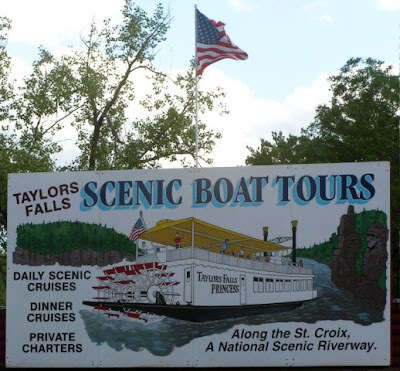 The Saint Croix National Scenic Riverway is a well-preserved 150 mile stretch of water that forms a portion of the border between Minnesota and Wisconsin. The preservation zone begins at the Gordon Dam, about 40 miles south of Superior Wisconsin. 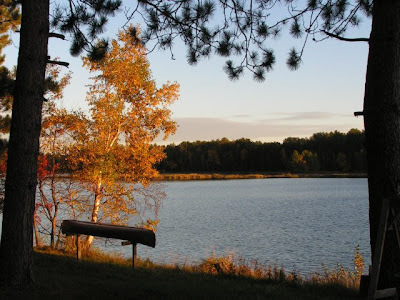 About 1950, Paul Pagac(1912-86) and his wife, Rose came across the beautiful Saint Croix Flowage that exists behind the dam. Paul and Rose fell in love with the area and built a cabin where they would raise their children. Paul set to work felling pine trees on the property and Rose stripped the bark from them. Soon they had constructed a five cabin resort that featured the classic northwoods experience that so many older residents of the Midwest recall fondly. In the 1940s and 50s, "going to the lake" meant packing up the car and family and heading to a resort like this. Two room cabins, a small fishing boat and swimming was all a family needed for a week "up north!" 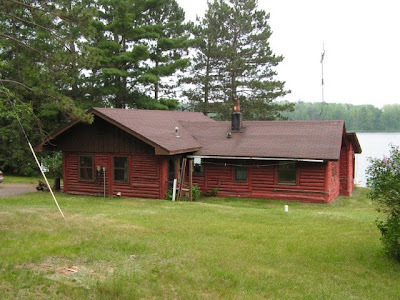 Linda and I are fortunate to have purchased the original Pagac's Pines home and office so we can easily transport ourselves back to this earlier simple life with an easy drive from the Twin Cities. 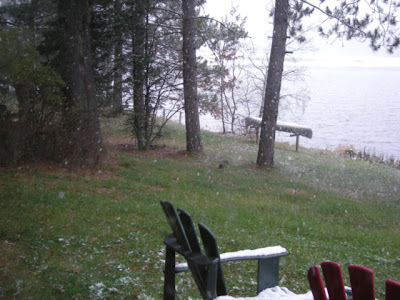 The 1913 acre lake is sparsely settled with much of the shoreline in county parkland. 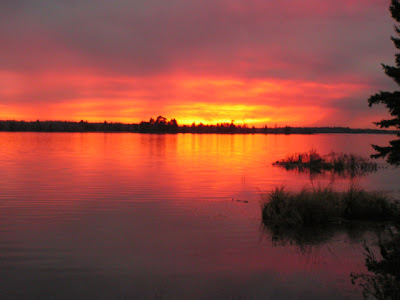 People living on and near the flowage take great pride in the area. 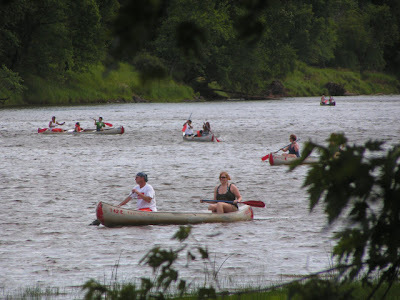 The Friends of the St. Croix Headwaters organization maintains a website dedicated to preserving and celebrating the area. They have extensive links to other sites with historic and current information. This past week, I headed up to the cabin to catch up on some of the summer chores. we all love to watch the "Theater of the Seasons." But this was a work trip. I mowed the grass and then went to our shed to get the "weed whip" to finish the job. 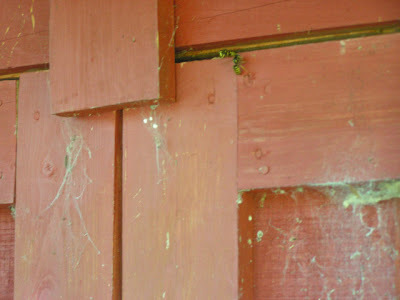 Yes those are wasps landing and moving into the shed through the crack above the door! I've seen this phenomenon before. 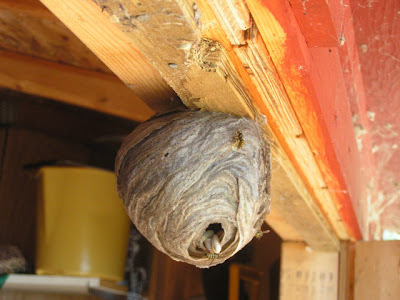 One of the challenges of a cabin in the North Country is to always find the wasp's nests before they find you. This called for drastic measures. 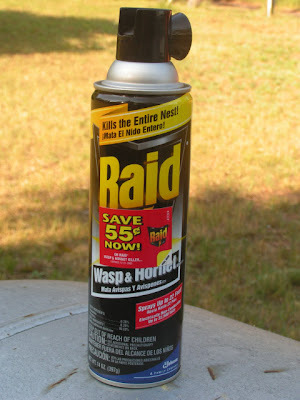 I got out the can of wasp spray. 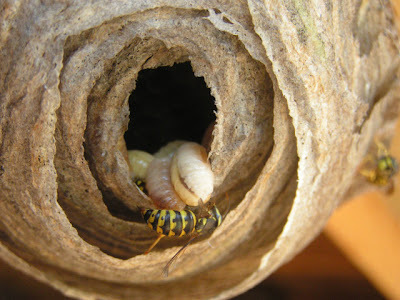 A quick squirt around the door opening and the wasps began to fall to the ground. It was a little bit like chemical warfare training at Fort Bragg. A sentry wasp was no doubt running around yelling "GAS, GAS!" and the soldier wasps were trying to respond as trained. I cautiously opened the door with a long stick. and there was the nest hanging from the door frame but partially pasted to the door. I gave them a bit more of the wasp spray and returned the next morning to take this picture. They died trying to save their babies. How sad. Meanwhile, all was quiet on the lake. I took the canoe out in the evening. 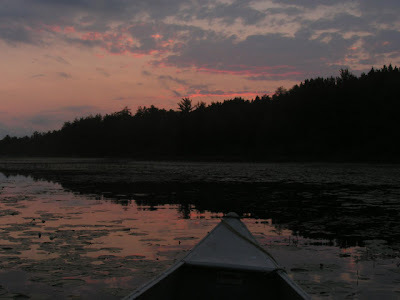 Paddling through the lilly pads, I listened to the frogs and then as the sun set, the loons were singing. Every day at the lake is a good day. We were hosting a student for the weekend and decided to have a picnic lunch and visit some of the sites at Taylor's Falls. We headed out of the Twin Cities along Interstate 94 to the St. Croix River that forms the border between Minnesota and Wisconsin. 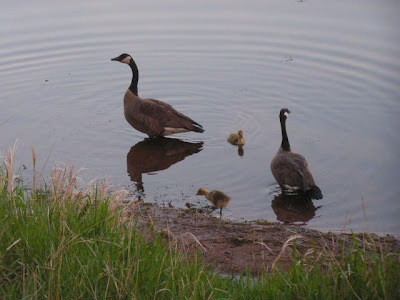 After passing through the bustling town of Stillwater that is always packed with visitors on a summer weekend, we soon arrived at Interstate State Park. 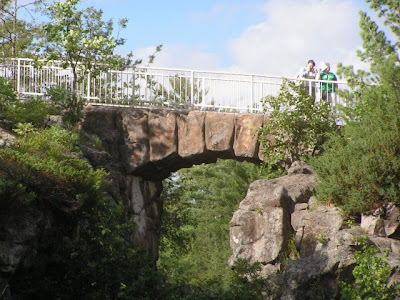 This interesting park spans the river and has portions in both Minnesota and Wisconsin. We stopped off at the southern entrance on the Minnesota side for a picnic lunch before going any farther. 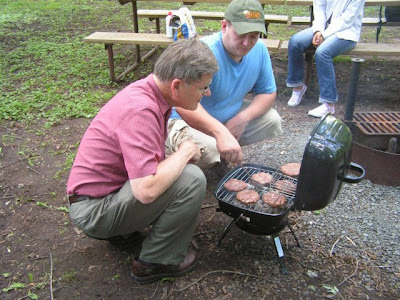 Terry and I put hamburgers on the grill. Terry supervised the operations using his chef's skills to determine when they were done (except for mine which I carefully preserved in "rare" condition atop the warming rack) on this fine $9.82 grill from WalMart. This lower entrance to the park features canoe rentals and we saw plenty of paddlers nearby. 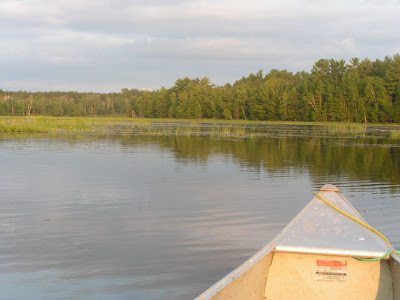 You can rent a canoe here for a trip down to Osceola, WI or all the way to William O Brien State Park (about 6-7 hours they say for this one) where you will be shuttled back to your starting point. After we finished our lunch with some of Linda's great homemade potato salad and a slice of watermelon, we headed up to the northern entrance to the park. If you are not in a hurry, you can walk the mile and a half up to this point along an old logging railroad bed. 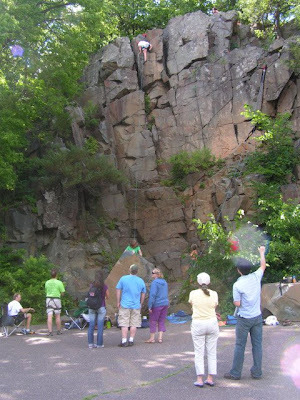 This part of the park features rock climbers, hikes through a few of the unique geological features of the area and nice views of the river. We had come for the stern-wheeler boat tour, so we picked up our tickets and had about forty minutes to wait before departure. This gave us some time to explore the area near the ticket office. 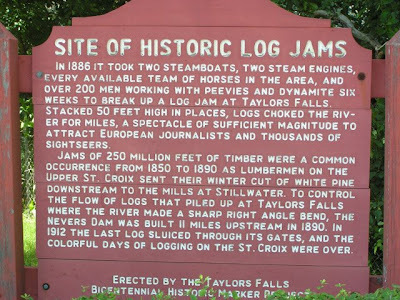 There are some nice historic markers that describe the settlement of the Taylor's Falls area and the logging business that made the St. Croix Valley the center of the lumbering industry in the Minnesota/Wisconsin area for a number of years in the second half of the nineteenth century. 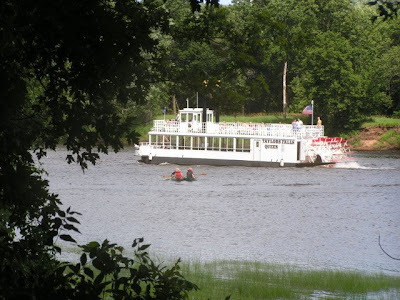 The St. Croix is shallow just upstream from the hundred-foot deep pool where our boat was docked. 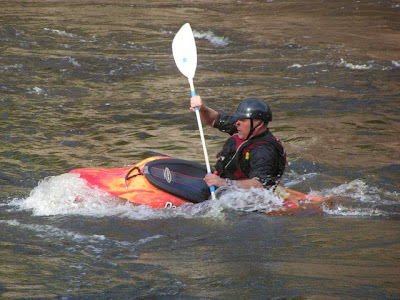 We saw a couple of kayakers out running through the rocks and practicing their moves. 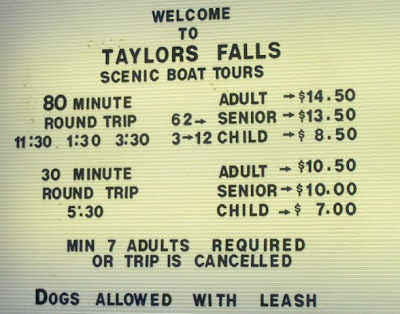 After the boat tour, we headed into the town of Taylor's Falls. It is easy to miss the town completely if you are just crossing the river on U.S. 8. The town is actually just north of the bridge along MN 95. There are a couple of interesting places to eat in town. 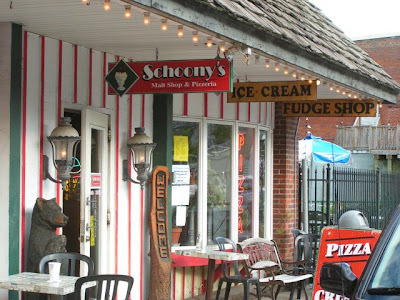 Right downtown is Shoony's Ice Cream and Malt Shop. They have an impressive selection of ice cream and a full "malt shop" menu as well. The building is interesting too. The tin ceiling, brick walls and wooden floor probably have not changed much in a hundred years. 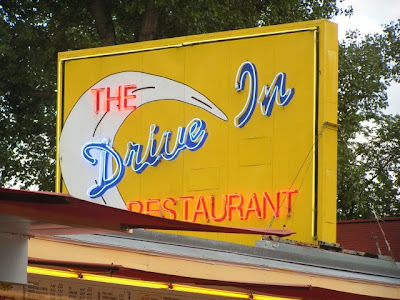 But if you are looking for 1950's and not 1915, just head north to the end of downtown and try The Drive In. Here you will find the burger and fries you have been craving since Scotty's last served up the "fourty-niner" - and they are served by a carhop in a poodle skirt.